It was a weekend to remember for the Irish star. WHILE THERE WAS plenty of talk of Rory McIlroy winning The Players Championship in Florida over the weekend, Leona Maguire may have flew slightly under the radar in the same US state. The Cavan golfer signed off with a top-five finish at the Natural Charity Classic on the Symetra Tour, rounding off her best week as a professional to date. Maguire played some excellent golf and showed plenty of encouraging signs at Winter Haven. With her twin sister Lisa on the bag, Leona carded rounds of 68, 68 and 71 across three days of play and she eventually finished four shots off the winner, Malaysia’s Kelly Tan. “It has been a great week,” she said afterwards, as quoted by irishgolfer.ie. While 24-year-old Maguire started her second event on this year’s Symetra Tour extremely brightly, she carded a one-under par 71 on St Patrick’s Day to finish on a nine-under par 54-hole total in difficult conditions. “The wind made those last four or five holes pretty tough,” the former World amateur number one admitted, slightly disappointed with how she closed. “They moved up some tees on the front side and I didn’t really take advantage of it. I hit some not great drives but my pace putting was really off. With her first five events as a pro resulting in 44th, 20th, 14th, 25th and 5th-place finishes, Maguire is motoring along nicely and well and truly finding her feet on the world’s biggest stages since making the leap last May. 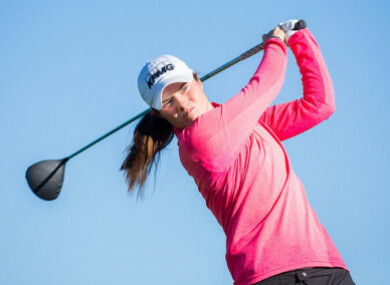 Her latest finish moved her to 12th in the latest Volvik Race for the Card standings on the Symetra Tour, with the top-10 at the end of the season securing automatic playing cards for the 2020 LGPA Tour. The Breffni twins, clients of One Direction star Niall Horan’s Modest Golf, will now avail of top-class practice facilities in Orlando thanks to the man himself, with Leona next in action at the IOA Championship in Beaumont, California. It was a good weekend for Horan overall, as Italian Guido Migliozzi won hist first European Tour event at the Kenya Open. Email “Cavan's Leona Maguire cards career-best pro finish as Niall Horan drives her on”. Feedback on “Cavan's Leona Maguire cards career-best pro finish as Niall Horan drives her on”.